Pardon the crappy cell phone photo, but when I was at our local pumpkin patch this weekend, I was inspired to write a post about the experience. You see, every fall for the month of October, a few of our local farms go all out and turn picking out a pumpkin into a rootin, tootin party. Some people may think the price of the pumpkins there are high, but I find that this is the perfect example of product differentiation. 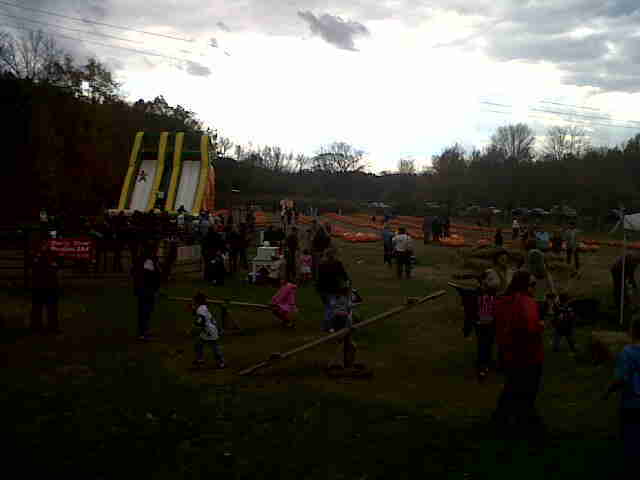 I am happy to pay extra for a pumpkin when the folks at Whitney’s make it an annual event to remember. They also have a HUGE selection to choose from. I’m guessing they have thousands all over the property. Similarly at Christmas time, they have hot cocoa, sleigh rides, and a great selection of trees, wreaths and garland. It’s places like these that make living in the Berkshires very fun. Sometimes I feel like one of the Gilmore Girls in Star’s Hollow. There is always some street festival or thing going on here, there and everywhere. I’m supporting a local business. I like going there, so I want to make sure I help keep them in business. They are truly providing an added value that I’m willing to pay a premium for. In contrast, before there was a Home Depot in the area, one of the hardware stores was routinely rude, overpriced, and very much reminded me of the classic only game in town business. Supporting the little guy just because he’s little isn’t enough for me. The company has to provide a differentiated product or service. I’m convinced that any product could and should be differentiated. If you have a business of your own, what are your differentiators? If you think of your favorite places, what is it about them that makes them so good? I’ll pick up the pumpkin theme, but take it a different direction. Here in Chicago, in a heavily populated metro area without too much in terms of wide open spaces, many people either A) Get a pumpkin at the local chain grocery store, or B) Drive an hour or two out of town in any direction (except East – the Lake!) to find an actual farm. Those farms often have attractions for the kids as you mention above (music, face painting, corn maze, petting zoo, etc). However, there’s one interesting place that’s a farm in a pocket of heavily populated subdivisions, in a very nice suburb. I wonder why these people are still holding out with that land, even making it through the last housing boom. Anyway, while they’re low-frills, they differentiate on location. It’s that easy, and it sets them apart from the others with more activities but are further away. Good post, and good things to keep in mind for any consumer or businessperson. Sir Squirrel – I love your examples. Location is definitely a great differentiator. I’d even say it’s THE differentiator for many businesses like coffee shops. I would never go out of my way to get coffee, but would stop at places en route to work. Certainly, kid friendly restaurants are another example. At some places you feel bad of the food mess all around your toddler, but the peanut place you’d feel right at home. I want to go to this pumpkin patch!!! How can people complain about the price of the pumpkins when there is so much great stuff there? The pizza shop near my house has the best homemade sauce. I gladly pay $11 for one serving of lasagna or $9 for a calzone – they’re tasty and make for at least 2 great meals. Catfish Cafe is a little out of our way, but they have the best gumbo. A bowl is $9, but it makes at least 2 meals too. We went to a farm in Rhinebeck, NY this summer where we picked peaches and blueberries. Then we made jam out of the fruits (for the first time in our lives). The kids, the wife, and I had a lot of fun picking fruits and making jam. That weekend was one of these very memorable times that make life worth living. And all for a reasonable expense. Everyday Tips – I’m going to prove your wrong tomorrow. I’m doing a post on funky corn mazes tomorrow and there are definitely some in Bloomfield Hills. That’s near you right? Crystal – What’s big in these parts is locally grown organic produce. There are quite a few places that use only organic ingredients and they’re food is divine. It always tastes super fresh. Those are the places with the lines out the door because they are a unique part of the dining experience here and the tourists love them. Ctreit – we make an annual batch of currant jelly from my mom’s garden. My kids LOVE squashing the berries with a potato masher as they are cooking. It is very fun for them to help. It’s funny but I used to hate picking fruit from my mom’s garden growing up (because she had so much of it), but now I remember it fondly. Thanks for your comment. Welcome to the site.